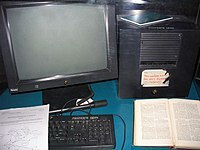 This NeXT Computer was used by Sir Tim Berners-Lee at CERN and became the world's first Web server. Abbate, Janet. Inventing the Internet, Cambridge: MIT Press, 1999. Bemer, Bob, "A History of Source Concepts for the Internet/Web"
Campbell-Kelly, Martin; Aspray, William. 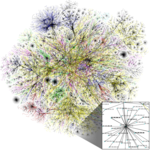 Computer: A History of the Information Machine. New York: BasicBooks, 1996. Graham, Ian S. The HTML Sourcebook: The Complete Guide to HTML. New York: John Wiley and Sons, 1995. Krol, Ed. Hitchhiker's Guide to the Internet, 1987. Krol, Ed. Whole Internet User's Guide and Catalog. O'Reilly & Associates, 1992. Scientific American Special Issue on Communications, Computers, and Networks, September 1991. ↑ Ruthfield, Scott, The Internet's History and Development From Wartime Tool to the Fish-Cam ওয়েব্যাক মেশিনে আর্কাইভকৃত ১৮ অক্টোবর ২০০৭ তারিখে, Crossroads 2.1, September 1995.